Size of Male: 45-65 lbs., 21-23.5 in. Size of Female: 35-50 lbs., 19-21 in. Sammies are an ancient breed but they took after the name of an Arctic nomadic tribe that first found use for them. The dogs towed boats, hunted bear, herded reindeer and warmed the beds of children. At the beginning of the 20th century, the Samoyed dog reached England and found favor in Queen Alexandra’s court. The dogs then entered America as gifts and made a name in the field of sled racing a century after. The smiling Sammies have not lost their appeal as all-around utility dogs. Their stunning looks are gaining more and more fans up to this very day. A friend to all, this dog breed can bark to their heart’s content in piercing shrills but they do not attack. Sammies are rather docile creatures who require the constant attention of their human owners. If you plan to raise a smiling Sammy, be sure you have enough time and energy for your pet. Neglect and inadequate human interaction are sure recipes for destructive digging, biting and barking. Living Environment – Their wooly double coat makes them well adjusted to cooler climates and extremely intolerant to heat. Homes located in snowy regions are optimal. While the Samoyed dog may enjoy outdoor activities, its desire to bond with you and your family makes the breed a certified indoor pet. A small yard is ideal but not required for your Sammy’s exercise regimen. Grooming – If you or anyone from your household suffers from allergies, keeping a Sammy might trigger attacks. The breed sheds heavily and you need to keep up with coat care. This is not among good dogs for people with allergies. During shedding periods, daily brushing is a must. On other days, 2 to 3 combings a week will suffice. You may also use cloth to wipe away dirt from their coat. To prevent allergies, remember to blow-dry the coat after a shower. Diet & Exercise – At all times, make sure to replenish your pet’s drinking bowl with fresh water. The following dietary ingredients are strongly recommended: poultry, tuna, potatoes, fish and horse meat. This dog breed has average exercise needs that must be met on a day-to-day basis. You may walk your dog, let your dog jog with you, or leave the pooch to engage in vigorous play within the yard. Since Sammies get easily bored, consider varying the activities. Aim to introduce something new every now and then. Health – This is one of the healthier canine breeds around. Nevertheless, it pays to stay vigilant and make vet visits a habit. The dogs are not spared from potential dog eye problems such as cataracts and glaucoma, as well as the common yet fatal bloat. 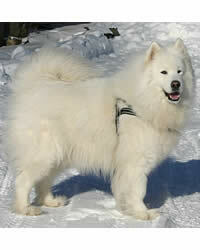 The intelligent Samoyed dog is willful and mischievous in the area of dog training. You must be dominant and consistent enough to convince the pooch that you’re the alpha of the home. Address attention-span problems by using a variety of handling methods. As you need to change styles every now and then, don’t be surprised when the training period for the smiling Sammy will take much longer than others.